A recent study of the nursing workforce in South Carolina hospitals shows that the labor market for registered nurses (RNs) is tightening up. Chief nursing officers in South Carolina acute-care hospitals were asked to assess the local labor market for nursing personnel in their area and to describe how their nursing workforce needs are changing. Eighty percent of eligible hospitals responded to the survey. Like most employers, hospitals would prefer to hire experienced employees, but 88 percent of hospitals report that finding experienced RNs is becoming difficult. Hospitals have also been hiring new RN graduates – 23 percent expect that new graduate hiring will be greater this year than last. 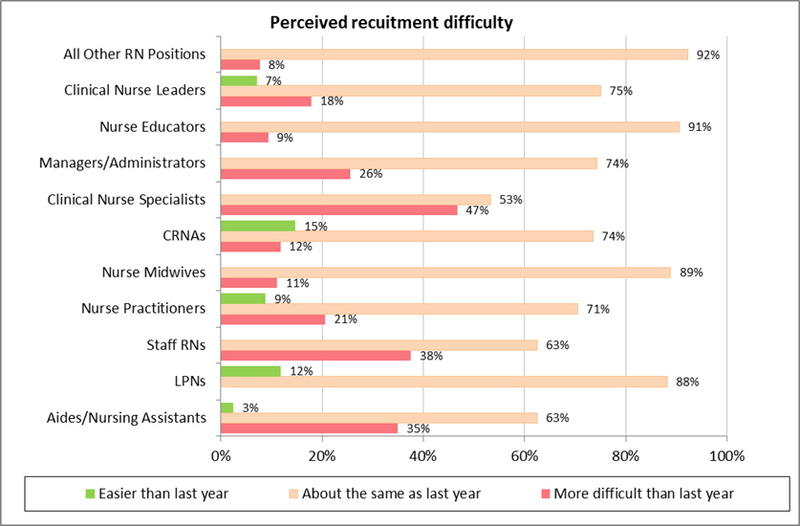 When asked about specific types of nursing personnel, most hospitals said that recruitment was no more difficult this year than last. 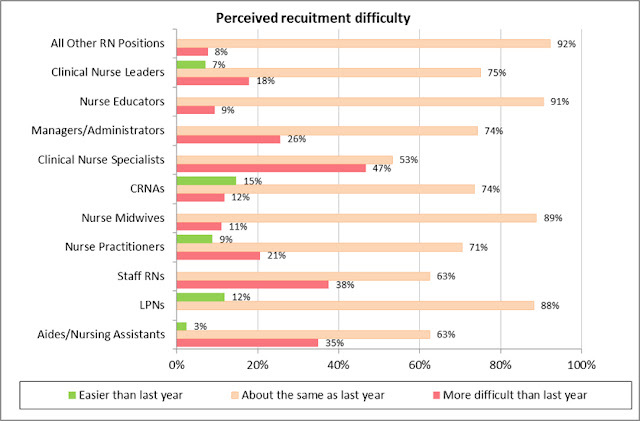 However, 47 percent of hospitals that utilize clinical nurse specialists said they were becoming more difficult to find; 38 percent of hospitals said staff RNs were becoming more difficult to recruit; and 35 percent of hospitals were experiencing recruitment difficulties with nurse aides. In the Upstate region of the state, 73 percent of hospitals reported difficulty recruiting nurse aides. Some of the tightening in the RN labor market is due to the growth in new roles for nurses. As healthcare delivery models change to focus on primary care and better coordination of care, nurses are being utilized in new ways. More than half of hospitals said that they had created new roles for patient care coordinators and patient navigators in the past year. These new roles are focused on helping patients coordinate their care across multiple physicians or care settings, such as when moving from the hospital to rehabilitation and then back home. A significant number of hospitals also expect to increase employment levels for different types of nurses during 2015. Fifty percent of hospitals expect to add new jobs for nurse practitioners; 40 percent expect to add new staff RN positions and 40 percent expect to add new jobs for nurse aides and assistants. Between 10 percent and 27 percent of hospitals responding to the study also expect to add jobs for nurse midwives, certified registered nurse anesthetists, managers and administrators, nurse educators, clinical nurse leaders, and clinical nurse specialists. The only type of nursing personnel likely to see fewer hospital jobs is licensed practical nurses (LPNs): 36 percent of hospitals expect employment levels to decrease for LPNs in 2015. The Office for Healthcare Workforce Analysis and Planning, part of the South Carolina Area Health Education Consortium at the Medical University of South Carolina, is funded by a grant from The Duke Endowment. Located in Charlotte, NC, the Duke Endowment seeks to fulfill the legacy of James B. Duke by improving lives and communities in the Carolinas through higher education, health care, rural churches and children’s services. Since its inception, the Endowment has awarded more than $3 billion in grants.